Children learn what it means to be meek from the Pharisee and the Publican. A pattern for this craft is available to members of The Resource Room and as an instant download above. 2. Print out the leaf patterns onto green paper and cut them out. 3. In class place all the shapes in the center of the table. 4. Tell your children to find five different mango shapes that are all different sizes and then glue them together, one on top of the other so that the Bible verse can be seen on each layer. Tell them to read the Bible verse on each shape before gluing them to the other shapes. 5. To finish glue on a stem and leaf. 1. Before class wash and dry the grapes. Cut carrots into tiny slivers for the antennas. Use an electric mixer to cream the cream cheese at room temperature with some marshmallow cream to taste. 2. 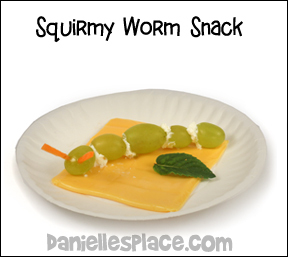 In class give each child a paper plate, a cheese slice, four or five grapes and a glob of the cream cheese mixture. Show your children how dip a grape in the cream cheese and stick it together with another grape. Tell them to stick all the grapes together to from Squirmy worm. 3. Poke two holes in the first grape where the antennas should go. Place to slivers of carrot in the holes to form antennas. 4. Place the larger grape head in front of the row of grapes. 1. Before class whip up cream cheese that is at warm temperature. Whip in powdered sugar to taste. 2. In class give each student a Graham cracker broken in half. 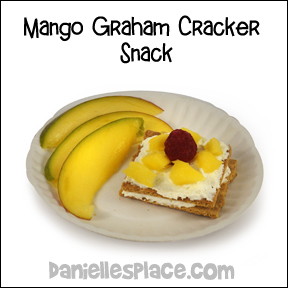 Have them spread the cream cheese mixture over a half Graham cracker and place the other half on top, and then spread cream cheese on top and sprinkle with cut up mangos. Go over the verse several times. Play some music and have the children hit all the balloons up into the air. When the music stops tell the children to hold onto a balloon. Write the first word of the verse on the board and ask the children to check their balloons to see if they have the balloon with that word. The child who has the balloon should place it in front of the room and then sit down. Start the music again and have the rest of the children hit the balloons up in the air. Stop the music and have the child that is holding the balloon with the next word on it place it in front of the room and then sit down. Keep playing like this until all the balloons are in front of the room. A pattern for this craft is available to members and as an instant download above. 2. In class have your children color sheet. 3. Discuss what it means to be meek. Many people think that being meek is a bad thing; that if you are meek you are weak. But meekness isn't weakness. To be meek means that you realize that everything you are, all your abilities and accomplishments, come from God. He created us and gave us those abilities. It is being humble. This game will help your children learn the Fruit of the Spirit. Available in both KJV and NIV. 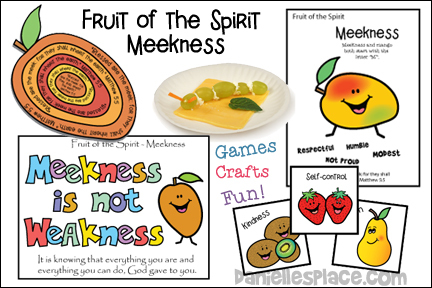 “Fruit of the Spirit” Lesson for Older Children - Children learn about how the Holy Spirit helps us to become more like Jesus. They learn that as we grow in Christ the Holy Spirit helps us to produce fruit that is pleasing and glorifies God.